I haven’t gotten a chance to shoot anything recently, and my screencasting plans have fallen by the wayside thanks to technical problems, so today I decided to dig up some photos from an older shoot and write a post about it. A little over three years ago, I shot my friend David’s senior portraits. We were both competitive divers at the time (although the “competitive” part was debatable in my case), and he wanted a set of diving portraits, so I went with him to practice one day to shoot. I had a 300mm f/2.8 lens checked out (one of the perks of editing the school’s yearbook), and I planned to put it to good use. I thought we’d get there a good hour before the sun went down, during which time I’d make some nice available light shots with the 300, and then once the sun set I’d play around a little bit with some lights. When we got to the aquatics center, we still had a little less than an hour of sunlight left. That would have worked great, except that that day the coach decided to have David work exercises and drills out of the pool for the first half-hour or so of practice…by the time he got on the boards, the sun was sinking low in the sky. Even that wouldn’t have been too bad, but the area with all the exercise equipment at that center is pretty tall, and it’s located directly to the west of the pool. Not long at all after I started shooting, the sun dipped below the top of the gym building, and I was left with the worst of both worlds: my subject was in the building’s shadow, but the sky was still brightly illuminated. I managed to get some pretty standard, mediocre shots with the 300, but certainly nothing to write home about. Soon after that, though, the sun went down all the way, the sky went black, and then the real fun started. I pretty quickly figured out that there was no way I’d get anything reasonable with what little lighting the aquatics center had on the pool (1⁄50 doesn’t work so well when your subject is twisting and flipping while falling), so I broke out my strobes and decided to see what I could do. I went for a simple cross-lighting scheme, as you can see in the image below. One of the lights is obvious enough, and the other was located just where the red arrow is pointing. 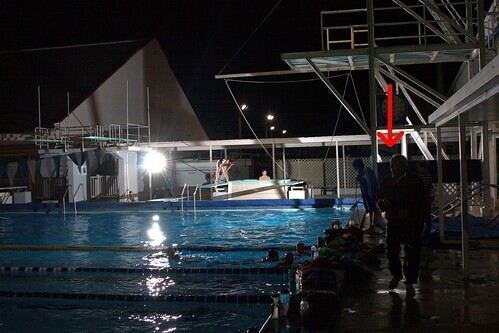 David was diving from the 1m boards in between the two lights. I started off shooting from behind the boards, which is where I got the shot at the top of the page. I had to do a little bit of a levels adjustment in post to get the background to pure black, but it was pretty much there straight out of camera. The sky had basically gone black, and all that showed up was David and the drops of water flying through the air. Well, there was a big obnoxious lap clock in the background somewhere, but I cloned that out. Of course, by this time I’d abandoned the 300 and moved on to my 50mm f/1.8, which worked great at that range. Autofocus was basically out of the question with the ambient light levels I was working in, so I just set the lens to manual and focused a couple of feet in front of the board. With my aperture stopped down a little bit I had enough depth of field that I could just point and shoot while David executed his dives. The cross-lighting gave me a dramatic look that I liked, and I just snapped away like that until I had some good keepers. While the behind-the-board shots turned out to be my favorites, I did spend some time working from another vantage point before I left. That roof-looking thing at the top right of the setup shot is the five meter platform. Normally you dive from it, but I climbed up on top of it to shoot down on David, after securing my camera to the platform with a rope, of course. It was a little bit of a challenge to keep that large arm structure with all the rope hanging off of it out of my shots, but I managed to shoot around it for the most part. If I had to choose, I’d pick my ground-level shots over the ones from the five meter platform, but I still liked the shots from above a lot. If nothing else, it’s certainly the only time I’ve ever gotten to shoot a diver in flight from above. At the end of the day, I walked away with a nice set of photos worth keeping from my simple little lighting setup, and I got a chance to try something I’d never done before. To date, that’s the only time I’ve ever shot sports with my own lighting. Things didn’t go at all according to plan, but once everything was sorted out I was quite alright with that.